Woven Version The BrandBand is a fresh and new upgrade to the silicone bracelet concept. 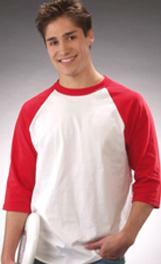 The imprint copy is woven into the polyester skin for a more upscale and professional look and feel. The BrandBand is made from high quality flexible plastic so it wont break or warp over time.A one Color Imprint on each side over any background color is included in the price. Size: 8" x 1/2" Imprint: 6" x 3/8" Weight: 6 1/2 lbs/100 pcs. 1/2" neoprene bracelet. Size: 1/2" x 6", 7", or 8"
3/4" neoprene bracelet Size : 3/4" x 6", 7", or 8"
Specify youth 7.25" or adult 8.25" you may mix, Includes individual polybag. Sizes : Adult size is 8.25"; youth sizes 7.25". Metallic overlay on solid color bracelet. Imprint is laser engraved to show the color of the bracelet through the metallic overlay. Engraved in our US factory. No waiting for overseas delivery! Please Note: The silver coating on #SILBRACS will wear off in time with normal use. Excessive hand washing, perspiration and lotion application will hasten this process. This is a normal feature of this unique product and is not considered a defect. Freight included in price for addresses within continental US. If you have any question in regard to the material, color or design, we highly recommend you request a sample of the golf kits before placing an order due to variations in color of kit components. Imprint Area: 1/4"h x 2-3/4"w Packaging: Bulk. Shipping Weight: 15 Shipping Quantity: 1000. Durable silicone band with flashing red, blue and yellow LED lights. Push button activation. Batteries not replaceable. Dimensions: 2 1/2" diameter band. Imprint Area: 13/16" W x 5/8" H - Oval shape. Each Additional Ink Color, Add $0.25 All Quantities. Pkg: 500 pcs, 21" x 11" x 11", 14 lbs. Add $20 for each additional color. No. SILBRACD is debossed deep into the bracelet. Most PMS colors for silicone are available. Produced overseas. Please Note: Less than 1st column quantity not available. Freight included in price for addresses within continental US. If you have any question in regard to the material, color or design, we highly recommend you request a sample of the golf kits before placing an order due to variations in color of kit components. Imprint Area: 1/4"h x 3"w. Shipping Weight: Freight included in price. Earrings, Bracelets, Necklaces, Rings, Toe Rings, Barrettes, any jewelry item can be made to order with your logo or design. Because each item is completely order, Please call factory, Charms available in finish of choice made as die struck, cloisonne or soft enamel charm. Amazing flexible and super clear vinyl wristband with saddle stitched leather double snap closure to fit all sizes. 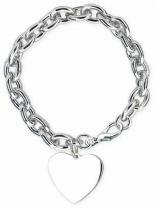 Size : 9" x 1.5"
7 1/2" link bracelet with heart charm, circle charm and lobster closure. Silvertone finish. Imprint Size: 1/2" Wx 1/2" H Other decorating methods are available for this item, please call. Packaging: Drawstring pouch Carton Dimension: 15x15x10 Shipping Weight: 100 qty - 7 lbs. 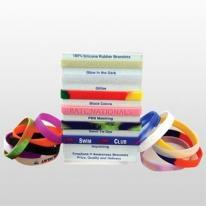 Fashionable magnetic therapeutic bracelets. IONETIX is a proprietory technology that utilizes two types of negative molecular therapy - minus ions & magnetics. These therapies have been known to help reduce stiffness in joints, lower toxin levels, improve blood circulation, lower stress levels, reduce pain and promote an overall feeling of well-being Polished stainless steel. Includes wooden gift box, with polydome logo, seen at left. Pricing includes up to a 10 color, non-metallic, polydome label on cover of wooden gift box. Label Size: 3" round diameter, polydome label, on box cover. Packaging: Individually boxed. Fashionable magnetic therapeutic bracelets. IONETIX is a proprietory technology that utilizes two types of negative molecular therapy - minus ions & magnetics These therapies have been known to help reduce stiffness in joints, lower toxin levels, improve blood circulation, lower stress levels, reduce pain and promote an overall feeling of well-being Polished stainless steel & 18K gold plate Includes wooden gift box, with polydome logo, seen at left. Pricing includes up to a 10 color, non-metallic, polydome label on cover of wooden gift box. Label Size: 3" round diameter, polydome label, on box cover. Packaging: Individually boxed. Fashionable magnetic therapeutic bracelets. IONETIX is a proprietory technology that utilizes two types of negative molecular therapy - minus ions & magnetics. These therapies have been known to help reduce stiffness in joints, lower toxin levels, improve blood circulation, lower stress levels, reduce pain and promote an overall feeling of well-being. Polished stainless steel. Includes wooden gift box, with polydome logo, seen at left. Pricing includes up to a 10 color, non-metallic, polydome label on cover of wooden gift box. Unit Size: 7.5" or 8" Imprint Size: 3" round diameter, polydome label, on box cover. Packaging: Individually boxed. 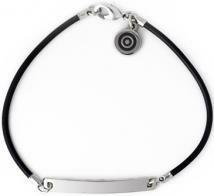 Fashionable magnetic therapeutic bracelets. IONETIX is a proprietory technology that utilizes two types of negative molecular therapy - minus ions & magnetics. These therapies have been known to help reduce stiffness in joints, lower toxin levels, improve blood circulation, lower stress levels, reduce pain and promote an overall feeling of well-being. Polished stainless steel. Includes wooden gift box, with polydome logo, seen at left. Pricing includes up to a 10 color, non-metallic, polydome label on the cover of wooden gift box. Unit Size: 7" or 7.5". Imprint Size: 3" round diameter, polydome label, on box cover. Packaging: Individually boxed. Fashionable magnetic therapeutic bracelets. IONETIX is a proprietory technology that utilizes two types of negative molecular therapy - minus ions & magnetics These therapies have been known to help reduce stiffness in joints, lower toxin levels, improve blood circulation, lower stress levels, reduce pain and promote an overall feeling of well-being Polished stainless steel & 18K gold plate Includes wooden gift box, with polydome logo, seen at left. Pricing includes up to a 10 color, non-metallic, polydome on cover of wooden gift box. Unit Size: 7.5" or 8". Imprint Size: 3" round diameter, polydome label, on box cover. Packaging: Individually boxed. 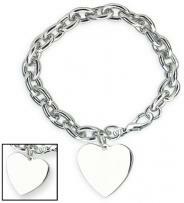 Fashionable magnetic therapeutic bracelets. IONETIX is a proprietory technology that utilizes two types of negative molecular therapy - minus ions & magnetics. 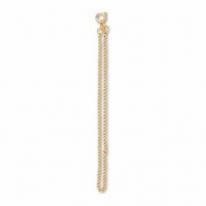 These therapies have been known to help reduce stiffness in joints, lower toxin levels, improve blood circulation, lower stress levels, reduce pain and promote an overall feeling of well-being Polished stainless steel & 18K gold plate. Includes wooden gift box, with polydome logo, seen at left. Pricing includes up to a 10 color, non-metallic, label polydome on cover of wooden gift box. Label Size: 3" round diameter, polydome label, on box cover. Packaging: Individually boxed.